I prepared this Mango muffins along with the Mango and Oats Smoothie which I posted earlier. There I mentioned I need to finish my mango pulp as it’s expiry date is nearing.. So I tired this Mango Muffins with that pulp and this is the first time I added eggs in baking. It came really soft and tasted great. 1. Add all the wet ingredients together and beat them until smooth as shown. 2. Mix the dry ingredients and sift them twice at least so that the baking powder and baking soda gets well mixed. Add this little by little to the wet ingredients. 3. Best both of them until they are about to form spikes. Add the nuts and dates and just give a little stir. 4. Transfer the content to the muffin cups and bake them for 15 to 20 min or insert a stick in the muffins and check they come out clean. 5. Serve the hot muffins. 1. If you want to check whether muffins are ready, check after 15 min. 2. You can replace the cashews with walnuts and dates with raisins. 3. Fresh mango pulp and little mango pieces can also be added, which enhances the taste. 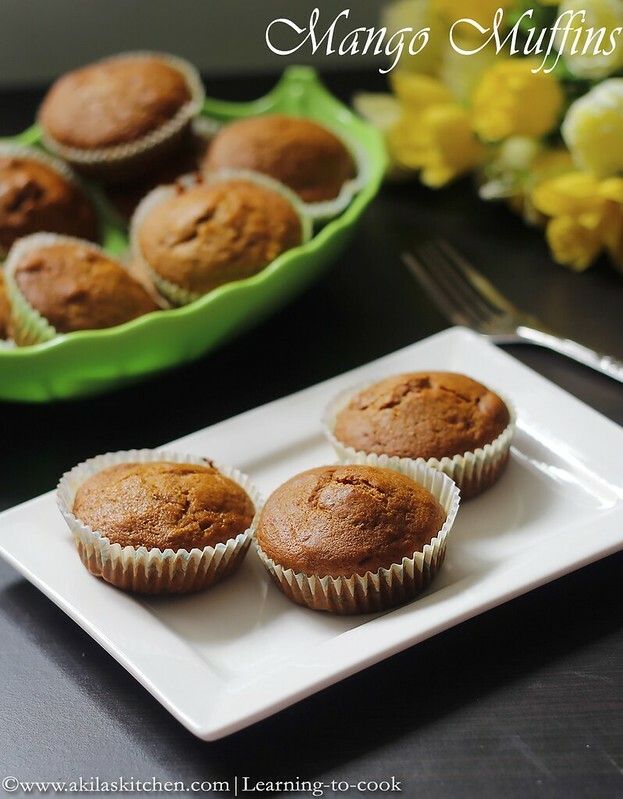 Very moist and super softy muffins, mango muffins are always my fav. 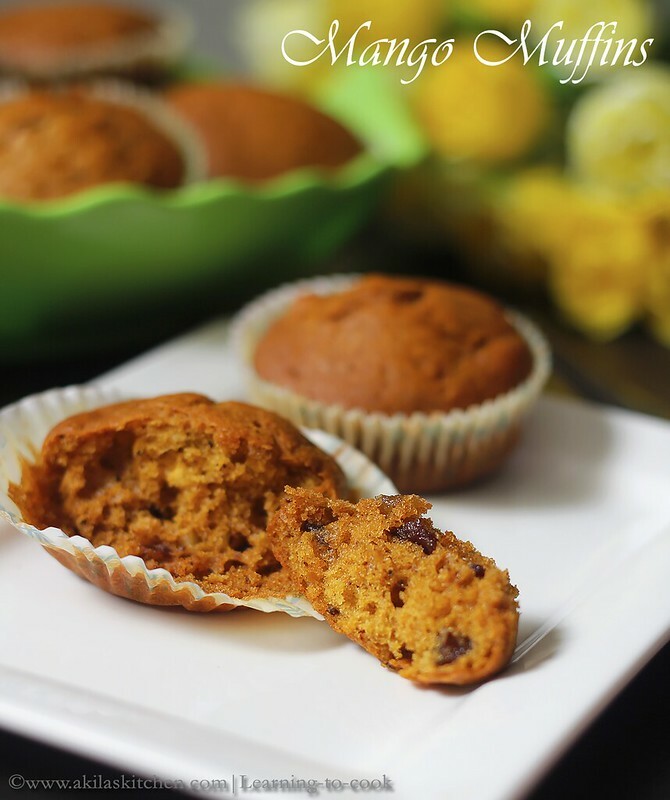 super soft and yummy muffins. 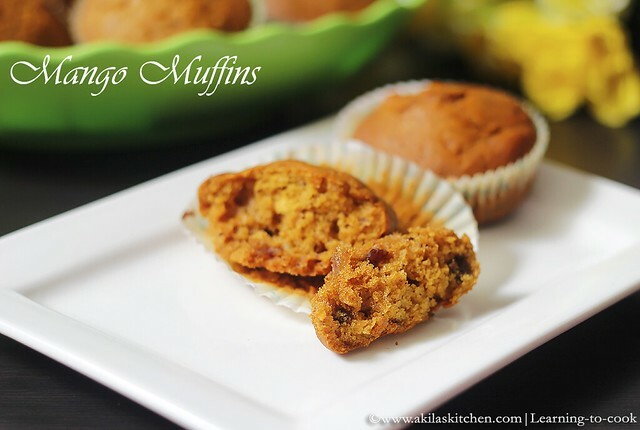 Wow Akila yummy mango muffins.I too tried this its really nice.With this I did whipping and cream cheese frosting.It really add nice flavor to this muffins.Give a try. It is so innovative and looks very yummy.. 🙂 Glad I have come across your page..
Wow it looks so soft and very very tasty…. Wow it looks so soft and very very yummy…..